Now that the overarching structure of Marvel’s Inhumans is at least sort of clear, it’s a relief to come to Gorgon’s episode. The plot and dialog have continued to be rough, but free of his inexplicably friendly and supportive human friends Gorgon (Eme Ikwuakor) has been a bright spot in an otherwise dull show, particularly when playing off of Karnak’s (Ken Leung) straight man act. It would take some rewatching to prove, but it feels like this episode dedicated less time to Gorgon than the previous ones did to their focal characters, which is definitely the smaller of the two insults to Gorgon in this episode. Despite having just reunited with both Gorgon and Karnak, Black Bolt (Anson Mount) and Medusa (Serinda Swan) split from them almost immediately at the start of the episode, the latter two going with Louise (Ellen Woglom) to find Crystal (Isabelle Cornish). Karnak and Gorgon are off to rescue Black Bolt’s human friends, held captive by the crew that Maximus (Iwan Rheon) sent to Earth. The episode spirals out quickly from there, showing Maximus spiralling even further into paranoia and fascism as the royal family continues to fight to return home, but ultimately a few strong scenes in the middle can’t make up for the grave sins committed at the end. Crystal is, as I said last week, the weakest link in an structurally compromised chain. It’s hard to find anyone to be sympathetic with on this show, but Crystal probably the worst of the bunch. She continues to be petulant and bratty, pushing a still-injured Lockjaw to take her all over Hawaii on dates with Dave (Chad James Buchanan), the guy that hit Lockjaw with his ATV and injured him in the first place. Dave cements his place in history as a terrible Hemsworth reject with a badly timed “God of Thunder” joke in the second half of the episode, and the incredible lack of chemistry between the two of them makes for dull scenes that feel like some producer’s desperate attempt to make the show appeal to young women. I’ll let producers in on a secret: plenty of young women like superhero comics without any romance at all, and if you’d done a better job establishing the relationship between Crystal and Lockjaw that same demographic would have been hugely invested. If you want a roadmap, check out G. Willow Wilson’s Ms Marvel run. 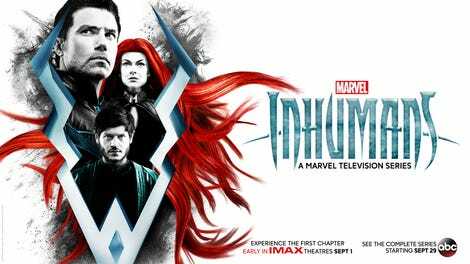 Dave, Louise, Sammy (Faleolo Alailima), and Declan (Henry Ian Cusick) feel like little more than plot devices at this point, a reason for all the Inhumans to smile fondly at one another and admit that they’ve made a few friends along the way. That humans might not be that bad after all. It feels like a particular cheat with Declan, who’s barely on screen at all, probably because they couldn’t afford to keep paying Cusick. Some people remarked upon Sammy’s penchant for running off the second he sees an opportunity to flee, but given that Black Bolt and Declan have nearly gotten him killed multiple times I find it hard to think of that as anything but a smart move towards self preservation on his part. The biggest joy of the episode is being able to watch Karnak and Gorgon interact again. There’s certainly some antagonism between them, but that’s often the case between family members that are as close but also different as these two. There’s a clear fondness between the two of them, and a respect that’s shifting as Karnak’s insecurity about his compromised skills settles in for the long haul. The brief flashback showing the two of them training Maximus together went further to show the root of all three characters than the entire third and fourth episodes of the show did, and gave the audience an infuriating link at what could have been if the writing room had some insight into what makes comics work. There’s a sense of real camaraderie between Gorgon and Karnak in this episode that I’d been missing since the first two, though there’s little else I enjoyed from them. Even at less than 100%, Karnak’s ability to infiltrate the mind of the people he’s fighting and absolutely destroy their with simple psychological manipulation was great to see, and it was gratifying to see Leung get something to sink his teeth into. Watching Gorgon and Karnak work together to take out a much larger group showed an ability to cooperate and think beyond the self that the rest of the royal family hasn’t done a great job of demonstrating, and it reminded me a lot of how much I loved the two of them at the outset of this season, especially in comparison to everyone else. Auran (Sonya Balmores) and Gorgon’s fight was a bit over the top, but Mordis (Bridger Zadina) and Karnak’s was fun. Labelled as ruthless and cruel along with Black Bolt by Maximus and his supporters, it was interesting to watch Karnak and Gorgon refuse to kill their adversaries, instead doing their best to restrain them and, it feels safe to assume, bring them to justice. All that makes the loss at the end of this episode that much more jarring. Though the writers didn’t do a great job with the contrast between Black Bolt and Mordis, it was clear pretty quickly that Karnak’s capture of Mordis was far too easy. The danger there was transparent, and the outcome pretty obvious: one of the only people of color in the main cast was going to die, be it Karnak or Gorgon. Given that this was Gorgon’s episode and audiences got a far too brief reminder of what could have been if they’d stuck together instead of split up for weird pot farming and paramilitary adventures, it added insult to injury that Gorgon was the Inhuman to throw himself onto the grenade that Mordis had become. What’s worse is that when Black Bolt discovers what’s become of his cousin, it’s clear that Gorgon’s death is going to quickly be translated into motivation for him to reclaim his throne and punish Maximus. This puts us in the awkward position of equating Gorgon’s death with the loss of Medusa’s hair, the only other thing that Black Bolt has had any kind of emotional reaction to. I was reminded in that moment of David F. Walker and his essays about the fate of black men in movies, and on top of all of the ways that Marvel has failed black characters in the past few years, this felt like salt in a very old wound. Fans have railed against fridging women, killing them off for the sole purpose of advancing a man’s emotional arc, and the same logic must be applied to killing off any character from an underrepresented group to provide another character with motivation. It’s lazy writing, an unimaginative and tone deaf attempt to elicit an emotional response from the audience, but the feeling it’s most likely to get is anger and frustration instead of sorrow. It’s tempting, and would be comforting, to blame prestige television for the weird and unnecessary drive to kill off characters in order to prove how serious and worthwhile a show is, but in reality this has been happening in comics for years. Killing off a side character is standard operating procedure, and right now sacrificing a black man specifically is de rigueur at Marvel. There’s a lot of other things that could be said about this episode. That it’s interesting to finally see Maximus go off the deep end. That Marvel’s roster of handsome, sympathetic, slightly crazed villains does everyone a disservice and leads to a lot of young women becoming obsessed with woobified versions of truly terrifying, murderous characters. That the love triangle crap between Crystal, Dave, and Aubrey makes me feel sorry for Liv Hewson, going from Santa Clarita Diet to this. That this is the first episode where anyone asked why the Inhumans are on the moon, and Declan warned Auran that her abilities might be waning. If the trend of episode themes concentrating on one character continues, next week’s episode will be Crystal’s. I hold out hope that it might focus on Maximus instead, because I can’t even imagine where we’d go from here with her character besides slamming her door shut and screaming about how Medusa just doesn’t understand and that she loves Dave so much. But all of that is so dramatically overshadowed by the incredible waste of Gorgon’s death that it’s hard to focus on them for long. On a show that often feels like one giant missed opportunity, this may be the biggest of them all. Two people finally touched Lockjaw for half a second each and I breathed an actual sigh of relief. I laughed aloud when Rheon, laying flat on his back, held a hand up to get helped up and Ikwuakor walked straight over him. Louise is so clearly in love with Medusa that it’s almost uncomfortable. She stammers and flails a bit when Medusa smiles at her, touches her, is kind to her...pretty much anything. If this show was just a bit better, I bet it would have spawned so much fan fiction. There were so many little moments in this episode that I wanted to know more about: Auran abusing the Inhuman miners, watching Bronaja’s loyalties shift, the flashback of Maximus training. I wish they’d focus more on the stuff that’s actually compelling and interesting instead of the flashy stuff. Thank you Louise for finally asking why they’re on the moon and actually revealing that Inhumans used to live on Earth until humans got scared and started fighting them. Audrey’s attempt to use Crystal’s Inhuman status as an excuse for bigotry perfectly illustrates why using X-Men mutants and Inhumans as metaphors for racism or homophobia doesn’t work. Ultimately it was two pretty white girls fighting over an idiot. I really want to know who got permission to let their kid make the opening credits. They’re probably the least polished, least professional part of the show, and that’s saying something. Medusa saying “I love you but you are not helping” to Gorgon is how I feel about comics and related media pretty much all the time. I liked her delivery of that line. I look forward to Eme Ikwuakor’s next role. He, like Ken Leung, deserves so much better.